Dr. Michael McMullen was born in the United Kingdom and grew up in Hull, Yorkshire. He was saved at the age of 16 and called to ministry in the same year. Before attending university, however, Dr. McMullen engaged various kinds of employment, including work with the local fire brigade and in hospitals as an orderly and nurse. At the age of 24, Dr. McMullen began his studies at the University of Aberdeen, Scotland, from which he took his Bachelor of Divinity, Master of Theology, and Doctor of Philosophy degrees. His doctoral work on Jonathan Edwards was financed by a major government scholarship, gained on a competitive basis, and carried on partly at Yale University. 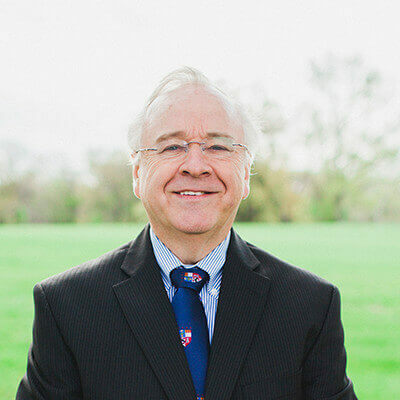 Dr. McMullen has pastored churches in Kirkintilloch, near Glasgow, and in Kansas City, KS; and he presently maintains an active supply-preaching ministry in the greater Kansas City area. He has been a part-time lecturer at Aberdeen University and a distance tutor both in at St. John’s College and the Open Theological College, UK. He has authored several books, including Hearts Aflame (Triangle/SPCK), Clouds of Heaven (Triangle/SPCK), The Passionate Preacher (Christian Focus), The Prayers and Meditations of Susanna Wesley (MPH, London), God’s Polished Arrow (Christian Focus), and The Unpublished Sermons of M’Cheyne (Banner of Truth). His 2004 work, The Blessing of God (Broadman & Holman), was a Gold Medallion finalist in the Inspiration category. He is also Associate Editor (Church History) for Oxford University’s New Dictionary of National Biography.